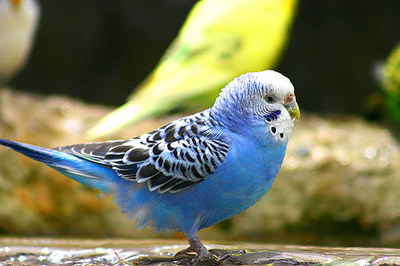 A budgerigar Budgie (not the one in the picture) shocked police officers after it started speaking. The brainy bird escaped from its home in the Sagamihara district of Yokohama on Sunday morning after darting out an open window. It seemed the pet budgerigar would never be seen again after it made a break for it while its 64-year-old owner was away. The budgie had been on the run for over three days before it checked into a hotel after landing in the room and onto a guest's shoulder. It was then handed over to the police who were able to track its owner, Fumie Takahashi, after being given an unexpected lead in the case. Ms Takahashi was surprised to see her pet again and even more shocked by its sudden new found ability to talk.